Matlock made it an unwanted hat-trick of cup exits against lower league opposition this term, as the Hillmen, from two tiers below the Gladiators in the pyramid, knocked them out of the Derbyshire Senior Cup. For the third time this season, Town failed to perform in a tie in which they were expected to win - and to make a poor night even worse, they lost both Oscar Radford and Adam Yates to injury - and missed a penalty which would probably have taken the tie into extra time. Yates, (left) who has fractured a cheekbone in two places and is undergoing an operation today (Wednesday 11th), after colliding with his own skipper Liam Needham, could miss a huge chunk of the season now, and the incident was typical in that Matlock created their own problems on the night. After leading through Lavell White's 10th minute header, they missed chances to forge further ahead as they looked comfortably in control. But just before the half hour, they let in a bad goal to allow home skipper Lincoln Adams to level and on 43 minutes gave away an even more soft goal as Sam Madeley scored the first of his brace. But Danny Holland's equaliser on the stroke of half time looked to have set Matlock up nicely for the second half and having looked the more dangerous early on after the break, Madeley scored again in the 56th minute to end the scoring. It all left Town boss Mark Atkins fuming. He kept his promise by fielding a strong side which saw Lee Featherstone slot in at full back with Radford switching to the centre as David Haggerty was ill. White came in for Martin Foster who was on the bench. Lavelle White's (left), goal came after a neat build up on the right which saw Corey Gregory pick out the unmarked number eleven to cleverly direct a header beyond goalkeeper Stefan Fielding. Glossop's response was to be continuously caught offside and there was little hint of what was to follow later. The lead should have been extended as Needham drove over the bar and Fielding pulled off a cracking stop from Shaun Tuton. Then Tuton had another great chance following Fielding's faulty clearance but sliced yards wide. But the contest was becoming niggly and was poorly controlled by Ilkeston official James Thornhill. 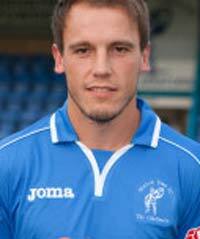 Home defender Dave Young kicked out at Tuton, who then drew personal retribution with a scything challenge on his attacker and was booked. Matlock were losing their earlier rhythm and Glossop's equaliser came from a free kick on the right which saw Adams bulldoze through to convert, leaving Jonathan Hedge, Radford and Featherstone all on the floor. A fine run from White followed by a great cross saw North End escape as the Town forwards were found wanting - and after James Ashmore pulled a twenty yarder wide, a speculative attempt from the hosts' Tom Bailey was no more than a yard off target. White wasted a glorious chance on 42 minutes, lifting Tuton's centre over the bar with only Fielding in front of him, before Glossop immediately were at the other end of the field, with Matlock presenting the ball straight to Madeley who could not believe his luck as he fired low past Hedge. 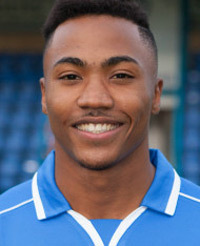 Holland netted his eleventh of the season and went in front in Matlock's scoring chart for the campaign as he pushed in a close range finish after Glossop had failed to clear a corner. 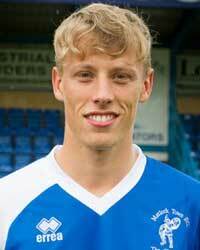 Joe Leesley replaced Radford with Featherstone moving into the middle. Bailey turned to fire wide from the edge of the box before Matlock had a good spell of possession without threatening Fielding. But they were caught out again when Nicholas Allen's penetrating low cross field ball had Matlock struggling and stretching and Madeley deftly pushed the ball past Hedge. Grayson immediately replaced Gregory and looked bright out on the right flank. Matlock's Man of the Match Danny Holland (left), looked to be impeded in the box but his claims for a spot kick were turned down and Grayson twice failed to find any power when well placed. After Leesley was yellow carded, Matlock had their gilt edged chance to save themselves on 73 minutes as a thirty yard strike from Grayson was handled by Allen. The assistant flagged furiously to wake up the referee who missed too much, and when the man in the middle pointed to the spot, the scene was set for Grayson to haul Matlock level but, a truncated run up saw an under hit shot pushed against the post by Fielding before the ball was scrambled to safety. Glossop could have made the game safe as only a tremendous Featherstone challenge denied Bailey before Hedge saved superbly from Kieran Lugsden. Adams went in late on Holland, causing a flare up which saw both men booked, before Yates' match, and maybe season, ended with nine minutes to go. Matlock could not find a leveller as Glossop cleverly retained possession up the pitch to earn a first win in living memory over Matlock, who now must concentrate on the league.